For reasons that are likely attributable to the California drought, the first figs appeared so early this year that I missed them entirely. This is the third season in a row that they have been ready in late April rather than late May and June. We’re now into the second round of production and I'm finding a good supply. Figs originated in ancient Arabia and Mesopatamia and were a much sought after symbol of abundance. The Spanish introduced them to the New World and I'm so very glad they did. I love homemade Fig Newtons, Fig & Oatmeal Chocolate Bars, galettes, figs in chocolate spice cake and Fig Swirl Ice Cream. I've even made fig jam and sandwiched it between blue cheese cookies. And one of my favorite seasonal desserts is a Provençal Sundae, coffee ice cream served with an unusual fig compote. If you love figs like I do, this is a very simple and delicious way to savor their beauty: baked upside down in a brown sugar caramelized topping over a wonderfully moist and flavorful cake. 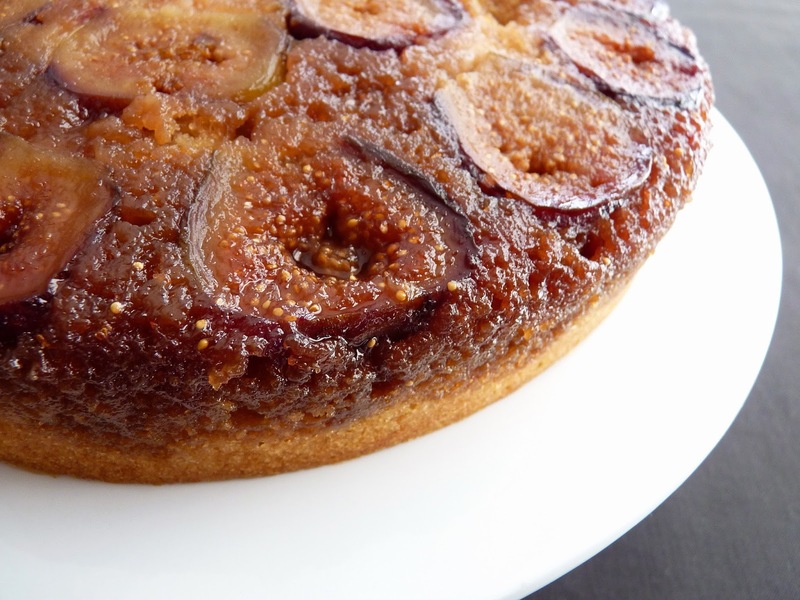 The simplicity of the cake allows the figs to shine but the cake itself is worthy of your attention. Buttermilk really lends a beautiful flavor and tenderness. That's because it's the acidity in buttermilk that works to tenderize cakes by breaking down the long strands of gluten developed in the mixing process. And since it works so well with baking soda, it's a great leavener that produces a light crumb. I know that a lot of bakers are now often substituting yogurt for the dairy in cakes but I really love the difference buttermilk makes here, so I encourage you to go with the real thing. This cake makes a great dessert or a nice weekend indulgence for your brunch table. Figs will be with us through the beginning of fall. Scoop them up! - "Room temperature" butter means the chill has been take off and it's pliable but not soft to the touch. It should not be oily or squishy but should give just a bit when you press a finger into the surface. - I added a splash of port to the warm honey I used to glaze the figs as the cake is cooling. - Other things you can do with buttermilk: Buttermilk Biscuits, Blackberry Cobbler, Chocolate Almond Raspberry Cake, Café Beaujolais Coffee Cake, Blueberry Lemon Cornmeal Cake, Buttermilk Bran Muffins. Preheat oven to 350 degrees F. Lightly grease a 9” x 2” cake pan and line the bottom with a circle of parchment. For the cake topping, melt the 1 1/2 oz butter and pour into the prepared pan, tilting to distribute evenly across the parchment surface. Sprinkle the brown sugar evenly over the melted butter and press to absorb. Cut the stems from the figs and slice in half. Arrange them cut side down on top of the butter and brown sugar mixture in any pattern you wish. Set aside. For the cake batter, sift the flour, baking powder, baking soda and salt. Set aside. Cream the butter and sugar until light and fluffy, about 3 minutes. Scrape down the bowl. Add eggs one at a time, beating well after each addition and scraping down the bowl as you go. Mix in the vanilla. Add the flour mixture in thirds, alternating with half the buttermilk and beginning and ending with the flour. Mix just until the batter is smooth, scraping down the bowl throughout to be sure the mixture is fully emulsified and blended. 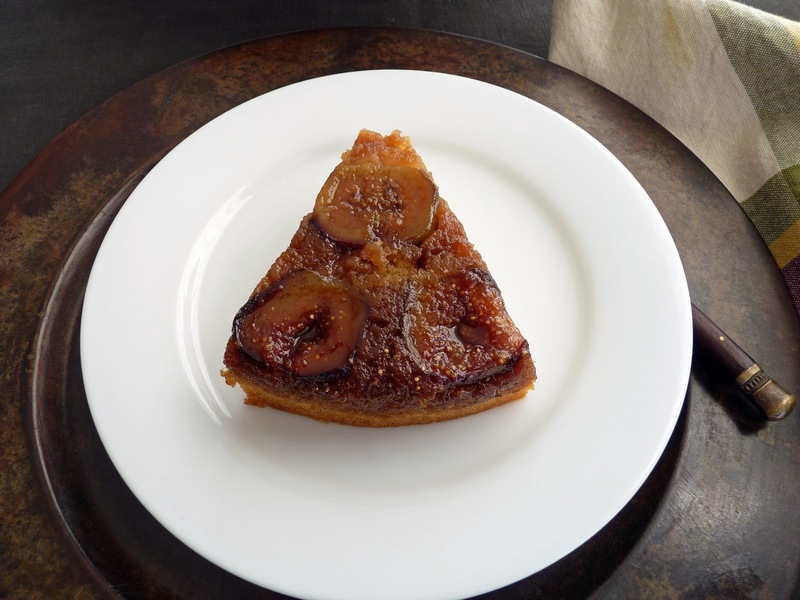 Pour the batter into the prepared pan and gently spread it to the edges of the pan, being careful not to dislodge the figs. Bake until a tester inserted in the center of comes out clean, about 40 minutes. Let the cake cool for 15 minutes. Run a thin bladed knife around the edges and invert the cake. Gently peel off the parchment and cool completely. Warm the honey and glaze the figs. 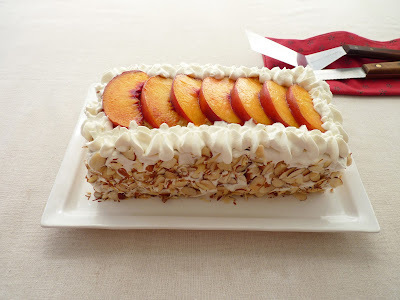 If you’re in the mood for a pastry project involving cake, whipped cream, almonds and fresh peaches, consider this one. The ingredients aren’t particularly fancy, it’s just assembled as a stacked cake and garnished for a more interesting presentation. It starts with a simple almond cake made with all the basic ingredients and a bit of ground toasted almonds. It’s a thin layer baked in a 9” square pan and then sliced in half to form two oblong pieces. The pieces get stacked with whipped cream and sliced peaches glazed in honey lemon syrup. 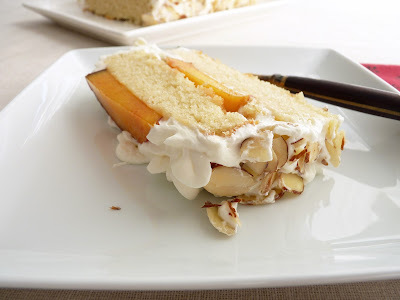 Then the sides of the cake are slathered with whipped cream and garnished with toasted almonds. It’s not very complicated but it does take some time to complete. Peaches are so delicious right now, I hope you’ve had the opportunity to enjoy them in a multitude of ways. This cake is just one more way to make this lovely summer last. - I like to use sliced rather than whole almonds for cakes because they'll grind finer in a food processor. You'll need a total of 1 cup (3 oz) for this recipe. 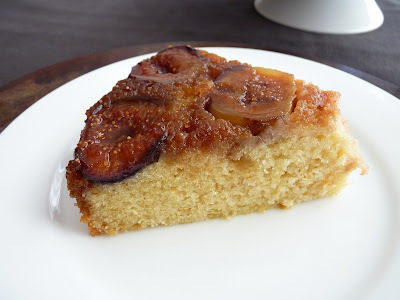 - I used blanched sliced almonds for the cake and unblanched for the garnish. But you can use unblanched for both if you don’t mind the brown speckles in your cake. - Let peaches ripen at room temperature. You should be able to smell their fragrance. I used one large peach or use 2 medium ones. - What's the difference between heavy cream and whipping cream? Heavy cream contains 36% milk fat; whipping cream has 30%. For finishing a cake like this, use heavy cream because it whips up with a stronger loft and will hold its shape longer than whipping cream without weeping. Cream whips best when it's very cold. If you have space, set your mixing bowl and whisk tool in the refrigerator to chill. - Give whipped cream just a few strokes with a whisk after it's been sitting in the refrigerator to refresh its texture. - I cut a piece of cardboard just about 1/4" under the size of the cake and built the cake on that. That way I could lift it easily and hold it in my hand to apply the whipped cream. But that's just how I work. You may find it easier to work with the cake placed on a platter. And no need to worry getting the whipped cream to look perfect. It will be covered with the almond slices. - Cakes begin to dry out once you cut into them so don't trim the cake until you're ready to assemble. - Chilling the cake allows the whipped cream to firm up before you apply the almond garnish and final touches. - Use any remaining peach slices and honey lemon syrup to either garnish your plated servings or to spoon over yogurt or ice cream. - For more information about using ground almonds in baking, see Almond Flour FAQs from David Lebovitz. 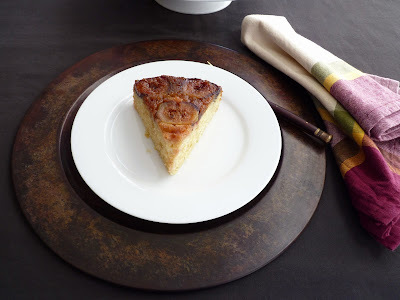 - If you have some almond paste, try this delicious Brown Butter Almond Cake for even more almond flavor. 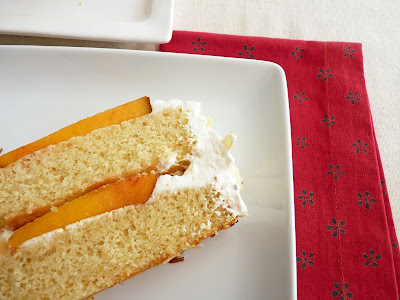 There's also the simpler Brown Sugar Cake with Peaches and Cream. And if you love chocolate and almonds together, there's this celebratory Chocolate Almond Raspberry Cake. Preheat the oven to 350 degrees F. Lightly grease a 9” square pan and line with parchment, leaving an overhang of an inch or so along two sides of the pan. For the cake batter, place the flour, 1/2 cup toasted sliced almonds, baking powder and salt in the bowl of a food processor. Process until the almonds are finely ground. Set aside. Whisk together the oils, sugar and eggs, mixing until thoroughly combined. Add vanilla and almond extracts and blend. Add a third of the flour mixture alternately with half the milk, beginning and ending with the flour. Pour the batter into the prepared pan and smooth it out evenly into the corners. Bake until a toothpick tests clean, about 23 – 25 minutes. Place on a wire rack to cool for 15 minutes. Run a thin knife around the edge of the pan to loosen the cake. Remove the cake, using the parchment to assist. Invert the cake and carefully remove the parchment. Cool completely. For the peaches, combine the honey and water in a saucepan and simmer to dissolve. Remove from heat and add the lemon juice. Cut the peaches into 1/2" slices and place them in the honey syrup as you go to prevent browning. Set aside, spooning the syrup over the fruit every now and then to coat. Whip the cold heavy cream, sugar and vanilla and almond extracts to a medium soft peak. Chill until ready to use. 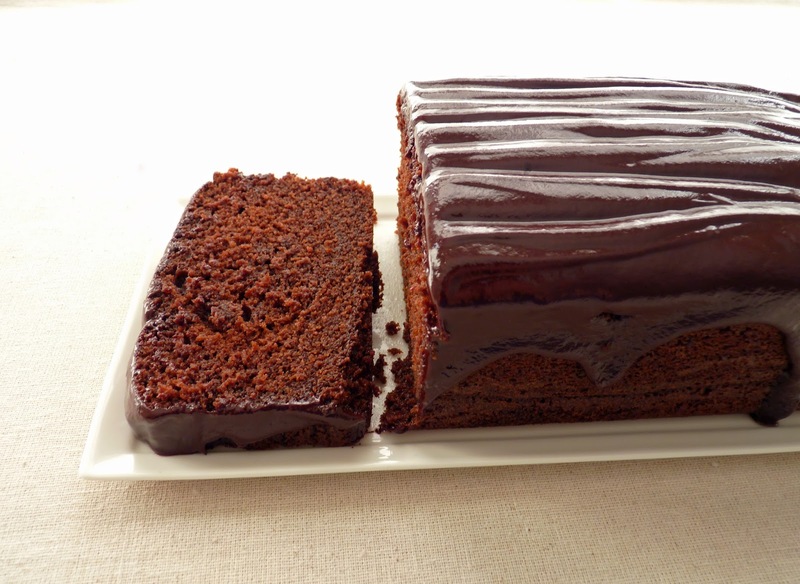 To assemble, use a serrated knife to slice the cake in two equal oblong pieces. Place one of them on a cake board or platter. Brush with some of the peach syrup. Spread about a 1/4” thick layer of whipped cream across the surface, leaving a small border on all sides. 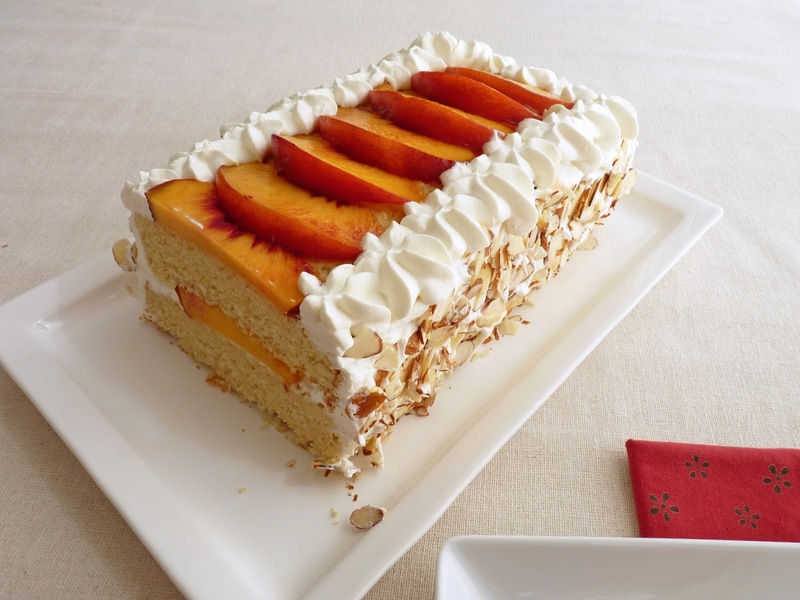 Line the center with peach slices. Place the other half of the cake on top and press down gently to secure. Brush the top of the cake with some of the peach syrup. Spread the whipped cream around the sides of the cake, leaving enough to pipe a border on top of the cake after it's been chilled. Line the center top of the cake with peach slices. Chill the cake along with the remaining whipped cream for about 1 hour. When the cake has chilled, gently press the remaining 1/2 cup toasted almond slices into the sides of the cake. Pipe the remaining cream around the exposed areas along the top of the cake. Chill until ready to serve. 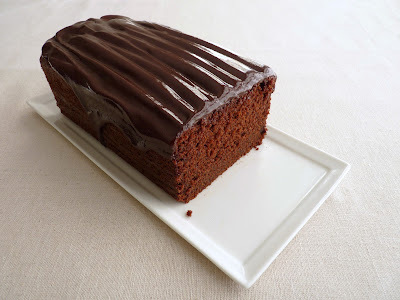 When the mood strikes and you want a slice of plain cake, chocolate usually comes to mind. Loaf cakes often settle this desire quite well. The larger round shape for cakes is likely modeled from ancient bread and persisted through their highest point of popularity in the Victorian era. But in modern times, cakes began to take on many different forms as they morphed into muffins, cupcakes and loaves - different versions that we can enjoy and not feel like we’re subject to any sort of penance. 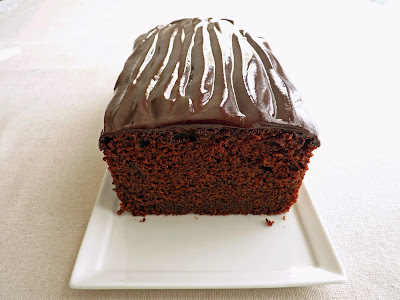 This cake has a good buzz of chocolate with some spice to round out the cocoa. It has a soft texture and isn't too rich or too heavy. I dressed it up with some chocolate glaze for a more formal presentation but it’s really a simple and straightforward cake that can be enjoyed plain or with a light dusting of powdered sugar. Easy peasy. If it’s the simple pleasure of a nice slice of plain cake you desire, fire up that oven and get going. 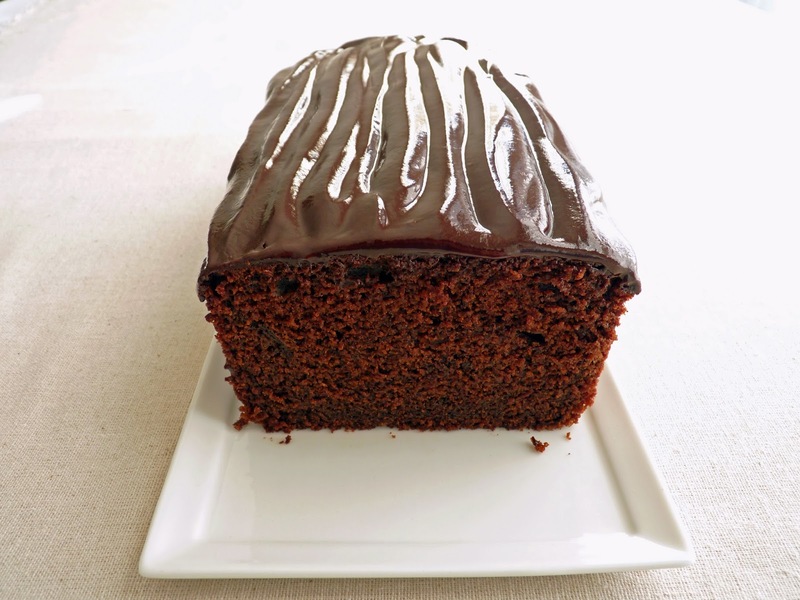 You’re just a hop, skip and a jump away from Chocolate Loaf Cake. - I used natural (not dutched) cocoa powder. - Mixing cocoa powder with hot water helps to “bloom” the flavor. - For the frosting, stir slowly to avoid cooling it down too fast before it's well blended and creating air bubbles. - Add 1/2 cup chopped toasted walnuts to the batter for a contrast of texture and nutty flavor. - More delicious loaf cakes: Walnut Brandy Cake, Brown Butter Banana & Chocolate Marble Cake, Honey Spice Loaf, Pumpkin Bread and Chocolate Date Nut Cake. Preheat your oven to 350 degrees F. Grease an 8 1/2” x 4 1/2” loaf pan and line with a piece of parchment paper large enough to form an overhang along both sides of the length of the pan. Sift the flour, baking soda, salt and spices together. In a separate bowl, whisk the cocoa and hot water together until thoroughly blended and smooth. Cream the butter and both sugars until light and fluffy, about 3 to 5 minutes. Scrape down the bowl and add eggs one at a time, making sure that each one is incorporated before adding the next and scraping down the bowl as necessary. Add the cocoa mixture and vanilla and combine thoroughly. Add the dry ingredients in 3 additions, alternating with half the sour cream and beginning and ending with the dry ingredients. Mix just until well blended. Pour the batter into the prepared pan and gently tap the bottom of the pan on the work surface to remove any air bubbles. Bake for 50 - 55 minutes or until a toothpick tests with a few small moist crumbs adhering. Place on a wire rack and cool 10 minutes. Run a thin bladed knife around the edges and lift out the cake using the parchment to assist. Gently peel off the parchment and invert again. Cool completely. 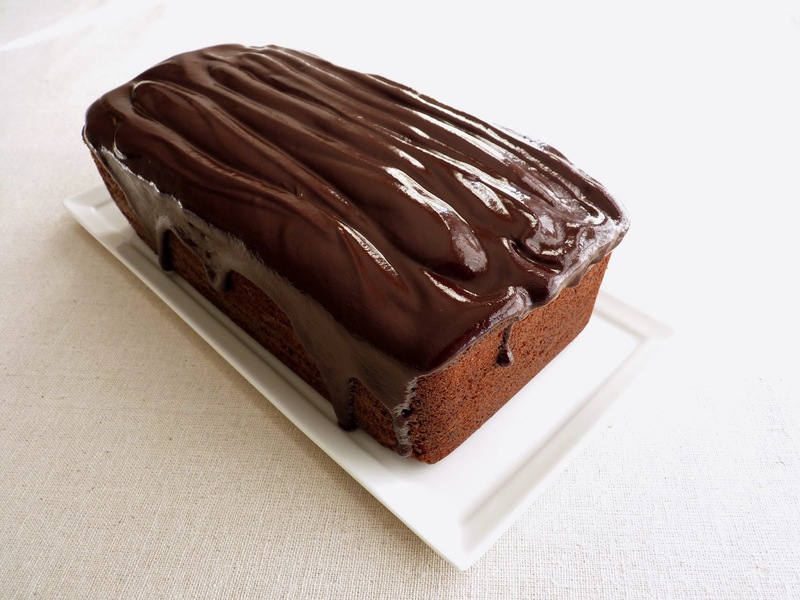 For the glaze, place the finely chopped chocolate in a heatproof bowl. Bring the cream to a simmer. Pour immediately over the chocolate and let it sit for a minute so the heat penetrates. Stir gently in concentric circles until smooth. Frost the cake when it's thick enough to spread. Summer desserts are often served à la mode and for stone fruit pies, cobblers and crisps, this Cardamom Ice Cream with Almond Crumble is one that will definitely complement our season's best apricots, peaches, nectarines, cherries, figs and plums quite well, not to mention pears and chocolate. 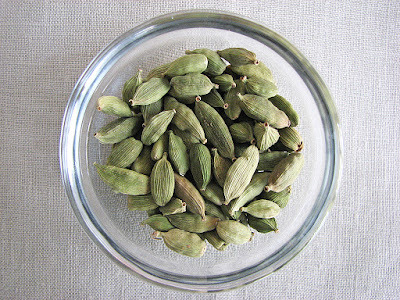 Cardamom is a spice of pure mystery. Among all the spices used in pastry, its aroma is probably the most haunting and its flavor most unique. It’s a spice I find completely impossible to resist. Native to India and Indonesia, Guatemala has become the biggest producer for world-wide consumption. 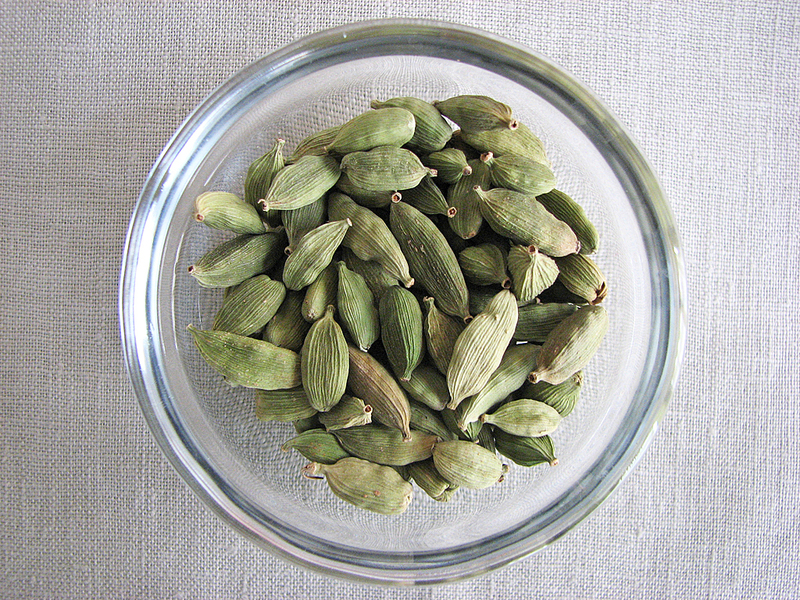 Cardamom is also a spice often used in Scandinavian pastries and as a flavoring in Turkish coffee and Masala Chai, an Indian spiced tea. 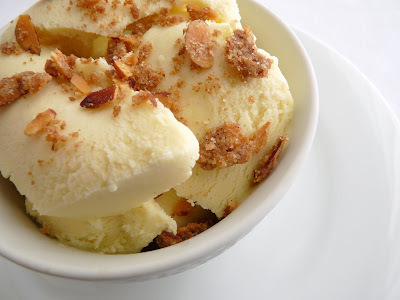 The almond crumble adorns each serving for a bit of a crunch and flavor but with or without, this is an ice cream that celebrates the distinct beauty of cardamom, pure and simple. - Rather then milk and cream in equal parts, you can also use 3 cups of half-and-half. - I like it as is, but after you’ve steeped the base with cardamom, taste for sugar. Add more if you’d like and heat the mixture again just to dissolve it. - Salt is necessary to make the flavor pop. Add just a few grains at a time and taste. You'll know when to stop. 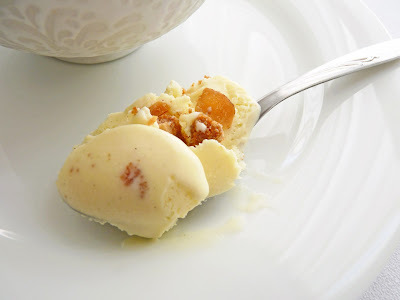 - When cooking a custard base for ice cream, it’s best to use a heatproof rubber spatula or a flat bottomed wooden spoon to stir rather than a whisk, for two reasons: a whisk will create air bubbles and make it harder to see how quickly the mixture is thickening and 2) you need a utensil that will scrape a broad surface area of the bottom of the pan to keep the mixture from heating too quickly and scrambling. The main goal is to stir constantly and thicken the mixture without letting it come to a boil. I like to cook it on medium low heat for more control and lift the pan up if it’s heating too quickly. 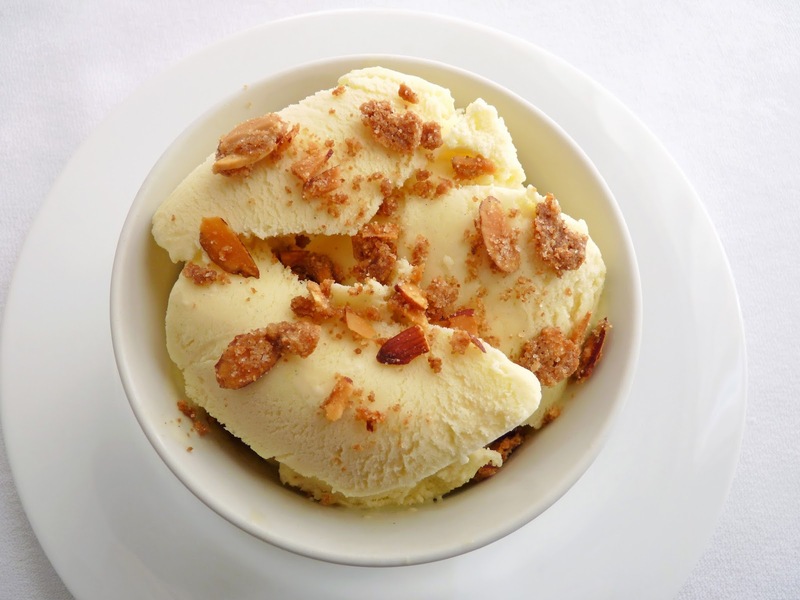 - Since homemade ice cream doesn't contain any commercial emulsifiers, let it sit out for a few minutes to soften before serving. - The crumble crisps up as it cools. If you have any leftovers, store it in an airtight container. - Pistachios would make a good substitution for the almonds in the crumble. Combine the milk, heavy cream, sugar and crushed cardamom pods in a saucepan. Stir and simmer over low heat until the sugar is dissolved. Remove from heat, cover and infuse for 30 minutes or until it’s reached the right strength for you. Strain out the crushed cardamom pods. Whisk the yolks together. Slowly add the cream mixture, whisking continuously. Pour the mixture back into the pan and return to medium low heat. Cook very gently just until the mixture thickens slightly, stirring constantly with a heatproof spatula to prevent the mixture from coming to a boil. To test for doneness, it should coat the spatula and when you run your finger through it, it leaves a trace. Take off the heat immediately and pour through a strainer into a clean container. Add 1/8 teaspoon ground cardamom, lemon juice and salt, to taste. When completely cooled, cover and refrigerate until thoroughly chilled or overnight. For the almond crumble, whisk together the flour, sugars, spice and salt until thoroughly combined. Cut the butter into small pieces and place on top of the dry ingredients. Toss the mixture, thoroughly coating the butter with flour. Rub the mixture together with your fingers until all the butter is worked into the dry ingredients, pinching it here and there until it collects and resembles coarse crumbles. Add the sliced almonds and combine. Chill until the oven is ready. Preheat oven to 350 degrees F. Line a baking sheet with parchment or a silpat. Spread the almond mixture on the prepared baking sheet in a single layer so the crumbles are close together. Bake the crumble until browned, about 10 - 12 minutes. The mixture will merge together and look like a sheet cookie. Place on a wire rack and let it cool completely to set up. Break into small pieces and set aside in an airtight container. Freeze the ice cream base in your ice cream maker according to the manufacturer’s instructions. Pour into a clean airtight container. Press a piece of plastic wrap on the surface and cover. Place in your freezer to firm up. To serve, let the ice cream sit for a few minutes at room temperature for easier scooping. Serve with a topping of almond crumble. Yes, indeed - it’s the time of year to grab your cherry pitter tool, put on your red shirt and pit a pile of cherries. It’s a bit of a tedious task but the benefits make it so worthwhile. This year’s crop of cherries is super sumptuous, so I say march onward to the kitchen to produce your favorite cherry pastries. 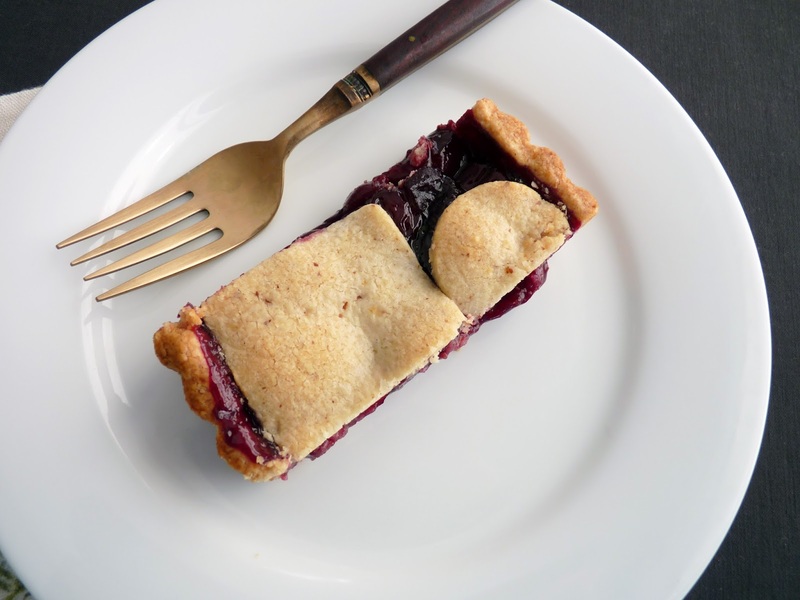 This cherry tart is a simply delicious way to enjoy cherries right now. It starts with an Almond Sablé pastry dough. The texture is crisp and crumbly like a sablé cookie and, as we all know, almonds are a great dining partner with cherries. This tart crust is subtly sweet with a pinch of lemon zest for an additional note of flavor. The dough is made in a food processor so it comes together in no time. Then it gets pressed into a tart pan so it’s completely no stress. The cherries are simmered with vanilla bean and a pinch of cinnamon to achieve their full flavor. Little pastry cutouts decorate the top. The tart is baked in just about half an hour. However, it does have to cool completely before serving so all the elements can set up properly. But I do guarantee you, it’s well worth the wait. - I like to use sliced almonds for pastry doughs because they will grind to a finer crumb. - You can substitute 1/2 teaspoon vanilla extract for the vanilla bean in the cherry mixture. Add it after you take it off the heat along with the lemon juice. - “Docking” is the process of pricking pastry dough before baking to create tiny holes that allow steam to escape. This helps to prevent puffed up bubbles in your tart dough. - Freezing the formed tart shell for one hour helps to prevent shrinkage. - Bake the tart on a baking sheet lined with parchment or a silpat to catch any juices that might bubble up. - Any remaining pastry cutouts can be baked off as cookies. Place them on a baking sheet lined with parchment or a silpat. Bake them until the edges just begin to brown, about 9 minutes. - You can also make this in a 9” tart pan with a removable bottom. - Once you remove the vanilla bean from the cherry mixture, rinse it off and let it dry. Store in a jar of sugar. The flavor is so pungent, I always recycle and reuse vanilla beans! - More cherry goodness: Cherry Crumb Bars and Lemon Cherry Pudding Cakes. To prepare the pastry dough, place the flour, sliced almonds, sugar, salt and lemon zest in the bowl of a food processor and process until the almonds are finely ground. Cut the cold butter into 1/2” pieces and add. Pulse until the mixture looks like coarse meal. Add the yolks and almond extract. Process until the dough begins to form clumps and holds together when pinched. Set aside about 2 cups (loosely filled) of the dough clumps. Press the remaining clumps evenly and smoothly into the bottom and sides of the tart pan, making sure you have an even distribution of dough. Trim any excess from the top of the border. Prick the bottom several times with a fork. Freeze the formed tart shell for one hour. Place the remaining dough clumps on a sheet of plastic wrap and press them together to form a flat disc. Put another sheet of plastic wrap on top and roll out to about 1/8” thickness. Slide onto a baking sheet and chill. 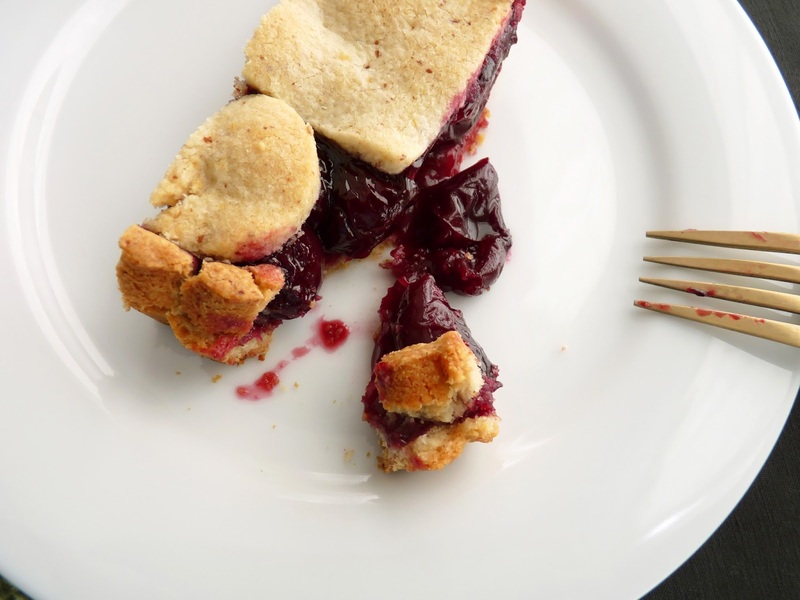 To prepare the cherry filling, place the pitted cherries, sugar and vanilla bean in a pan over medium low heat. Simmer until the sugar is dissolved, stirring to prevent scorching until the juices flow. Continue to simmer until the cherries begin to soften, about another 4 - 5 minutes. Stir the cornstarch and cold water together until there are no lumps. Add while stirring the cherries continuously. Cook for another 2 minutes until the juices thicken. Take off the heat and add the lemon juice. Remove the vanilla bean, pour into a bowl and set aside to cool completely. Preheat oven to 375 degrees F. Lightly grease a 14” x 4” rectangular tart pan with removable bottom. Put the tart pan on a baking sheet lined with parchment or a silpat and bake for 15 minutes. Place on a wire rack. Remove the sheet of dough from the refrigerator and peel off the plastic wrap. Cut out several shapes for the top decoration. 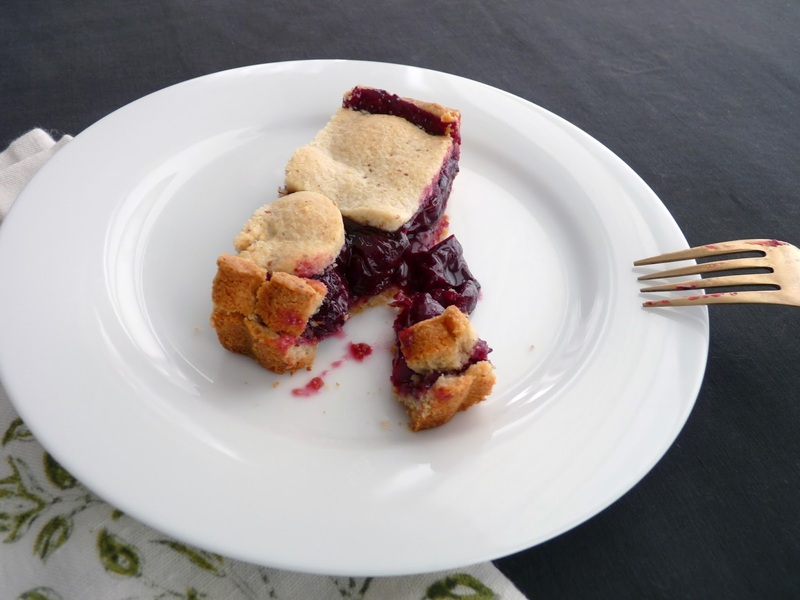 Fill the tart shell with the cooled cherry mixture, draining off any excess juices. Position the pastry dough cutouts on top. Bake until the crust is golden brown and the juices are bubbling, about 35 – 38 minutes. 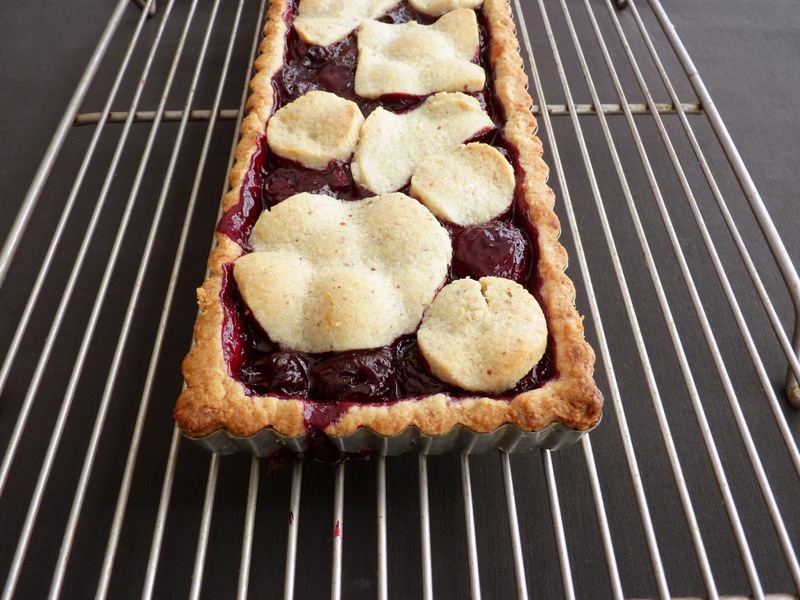 Place on a wire rack and cool for at least 2 hours to allow the tart to set up properly. Gently remove from the tart pan.